More Tesla and more art! I started an LJ group to update on the Tesla situation so anyone interested in updates can please go over there. Jane Alcorn, who runs the Tesla Science Center, invited me to their media event on May 30, and if you are in the Suffolk County area or willing to drive, she would love to have a lot of supporters come out. That info is in this post. I have gotten a bunch of donations, including several from people I have never met, and I am very thrilled that people are willing to be so generous when there's so much crap going on economically right now. I will pass on a check to the TSC next week and if donations keep coming, I'll write another check. I will try to do the artwork I owe people this weekend while I am in Connecticut! Ohgod, my mind just amalgamated 'Darcy' and 'Dalek'. The idea was to make my brain explode? Okay, so it was his brain. 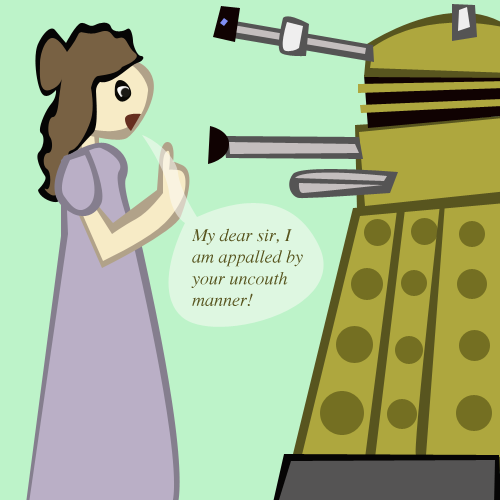 It is a truth universally acknowledged that a single Dalek in possession of a working disintegrator must be in want of a wife. Or victim. Same thing, really, for Daleks. I could easily forgive his pride, if he had not exterminated mine. I am in no humour at present to give consequence to young ladies who are exterminated by other men. Exterminate as much as you choose, but you will not exterminate me out of my opinion. I have been meditating on the very great extermination which a pair of fine eyes in the face of a pretty woman can bestow. Yay! I am glad you like it, it is one of my favorites!